One of President Obama's signature ideals is the eventual elimination of nuclear weapons. He's spent diplomatic capital trying to negotiate a new nuclear-arms-control agreement with Russia, and in his Nobel Peace Prize speech in December, he called atomic-weapons control "the centerpiece of my foreign policy," asking all nuclear countries to work toward disarmament. But when it comes to using nuclear power at home, Obama evidently feels a lot friendlier. Speaking at a job-training center in Lanham, Md., the President announced more than $8 billion in federal loan guarantees for the construction of the first nuclear power plants in the U.S. in more than 30 years. "To meet our growing energy needs and prevent the worst consequences of climate change, we'll need to increase our supply of nuclear power," said Obama. "It's that simple." Maybe it's that simple to President Obama  whose Administration estimates that the two new reactors in Georgia, which will receive the federal loan guarantees, will generate nearly 800 new jobs  but many greens feel uneasy about a policy that diverts scarce federal energy funds toward a technology that still has unresolved environmental risks and that has struggled for years to attract private capital. "The Department of Energy is putting taxpayers on the hook for bailing out costly and dangerous nuclear-reactor projects when the loans used to finance those projects default," said Ben Schreiber, the climate- and energy-tax analyst for the Friends of the Earth, in a statement. "This is great news for Wall Street but a bad deal for Main Street." Obama's decision wasn't surprising  in his State of the Union speech, he dedicated prime space to hyping nuclear power  and on Tuesday, Feb. 16, he reiterated the need for a "new generation of safe, clean nuclear power plants in America." 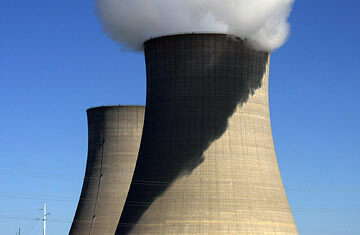 His proposed budget, released at the start of the month, would triple existing loan guarantees for new nuclear plants. While Obama has still done more to promote renewable energy than did any President before him, environmentalists are increasingly worried that greener sources like solar and wind are being downplayed in favor of nuclear, clean coal and biofuels  all centralized technologies that appeal to conservatives. And that may be the point: more-moderate Republicans like Lindsey Graham have made it clear that they believe that support for nuclear energy needs to be a part of America's new energy policy. By spending billions to back the nuclear industry, the White House may be able to get some Republican support for the floundering climate-and-energy bill, which would put a limit on greenhouse gases. "On an issue which affects our economy, our security and the future of our planet," said Obama in Maryland, "we cannot continue to be mired in the same old debates between left and right, between environmentalists and entrepreneurs." If Obama really can pull Republican votes for climate legislation, nuclear support might be a worthwhile price. And because the money is a loan guarantee, if the plants are built on budget and succeed, the funds would be reimbursed to taxpayers. But some environmentalists point out that there's a reason no American nuclear plants have been built in more than three decades: the projects tend to be hit with construction delays, and the Congressional Budget Office (CBO) estimates that the risk of default on a new nuclear plant is higher than 50%. In a conference call with reporters, Energy Secretary Steven Chu seemed unaware of the CBO report, although he downplayed the fiscal risk. "Even Wall Street traders say these reactors are too risky to invest in," said Schreiber. But as Obama pointed out in his speech Tuesday, even with all its problems, "nuclear energy remains our largest source of fuel that provides no carbon emissions." If a price is put on carbon, nuclear energy might look like a better investment down the line. And even in the absence of congressional action, such loan guarantees allow Obama to implement his energy policy directly, without the dithering Senate. As long as the much better-funded nuclear industry doesn't eclipse nascent renewables  which lack the lobbying muscle of the atomics  there should be room for all. "The fact is, changing the ways we produce and use energy requires us to think anew," said Obama. "That's what we must do. And that is what we have begun to do." See TIME's special report about the Copenhagen Climate-Change Conference.